Stroopwafels, often referred to as caramel syrup waffles, are a popular Dutch cookie often enjoyed with tea or coffee that consists of two soft round Belgian waffle-like disks with caramel syrup in between them that creates a chewy center. Thought to have originated near the Dutch city of Gouda sometime in the 19th century, Stroopwafels are still widely enjoyed today. Each 10.6 oz package of Verweij 100% Roomboter Siroopwafels comes with 10 individual Stroopwafels. 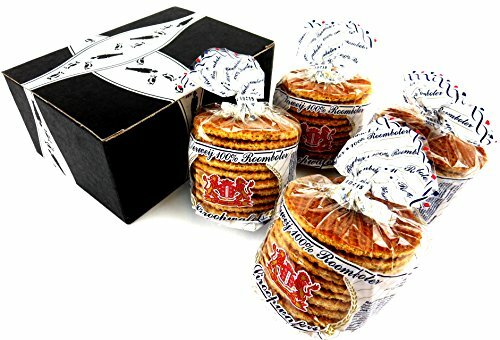 Now get a BlackTie Box for any occasion featuring four 10.6 oz packages of Verweij 100% Roomboter Siroopwafels (Butter Stroopwafels).